St Mirren have secured the services of Franco Miranda for next season after agreeing a new loan deal with Argentine outfit Club Atletico Internacional. The full-back spent last season with Gus MacPherson's side as they finished 10th in the Scottish Premier League. 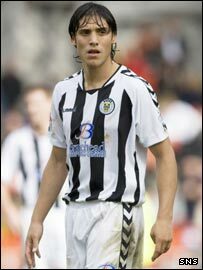 General manager Brian Caldwell told St Mirren's website: "We were always confident that Franco would be back. "He adapted very well to the Scottish game last season and I'm sure he'll be better next season." Miranda made 27 appearances for the Buddies in his debut season, scoring twice. The 23-year-old has previously had spells with River Plater and Racing Club Avellaneda in his homeland and has also played in Sweden with Helsingborgs.